This is only the second Sunday in Lent, but I am already longing for Easter, for that glorious celebration of the Resurrection. But that is in the future, and for now, I find myself lamenting. I lament not just my own sins, which are many, but the brokenness of this world. The news coming out of New Zealand about a mass murder weighs heavily on my soul. Such evil is a mystery, and it is hard to live with mysteries, with things we just can’t explain or understand. But, if the truth be known, evil is a lesser mystery. Fortunately for us, there is a greater Mystery, a countervailing Mystery, a triumphant Mystery, whom we call God. We encounter that Mystery in the first reading from Genesis. 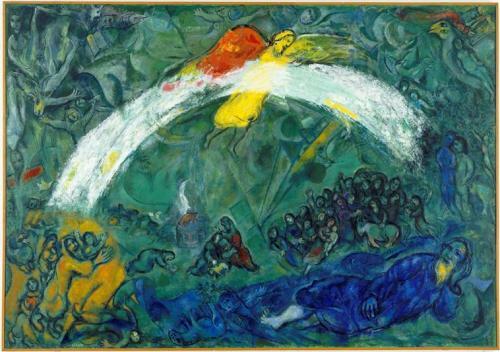 Abraham, who has not yet received his new name from God and is known as Abram at this point, is the recipient of a divine vision. God promises Abraham a great reward. But Abraham laments to God that no reward has any meaning to him since he has no children. God responds by promising Abraham offspring, despite the fact that Abraham and Sarah are both far too old to expect children. And God further promises that, from his offspring, he will have as many descendants as there are stars in the sky. 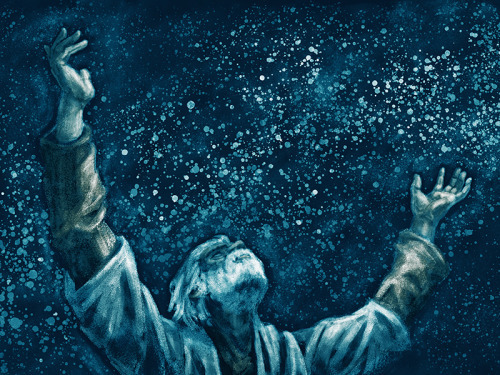 To his great credit, Abraham believes the Lord. God kept his oath to Abraham. He had children. And they had children. And some of their descendants did indeed inherit the Promised Land. Nowadays, we have DNA tests that you can take at home and mail in. 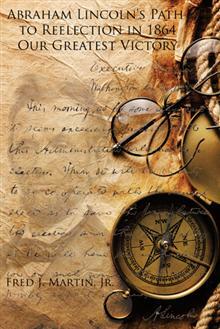 And I suppose that it would be possible to try to trace one’s ancestry back to Abraham. But that would be missing one important point. Not only did Abraham have many descendants according to the flesh. He had even more descendants according to the spirit. The purpose of self-examination during Lent is not to admire ourselves in the mirror and praise ourselves for our accomplishments, but to become aware of our temptations and to repent of our sins. Now, unlike the rest of us, Jesus did not sin, not ever. But he did know what it was like to be tempted. And in today’s Gospel, we hear the story of his temptation. It begins right after his baptism by John in the Jordan River. The English translation we heard today says, Jesus “was led by the Spirit in the wilderness, where for forty days he was tempted by the devil.” It makes it sound like the temptation of Jesus was a chance occurrence. The original Greek text, however, says something a little different. It says, Jesus “was led by the Spirit in the wilderness in order to be tempted by the Devil for forty days.” In other words, the entire event takes place at God’s behest, not the Devil’s. Why would God test his Son? Unfortunately, we are never told explicitly, but I have some ideas on the subject. I suspect that this time of testing was necessary for Jesus to figure out what kind of Messiah he was going to be and what kind of Kingdom he was going to proclaim—and then to come to terms with the consequences of those decisions. Each of the three temptations serves in its own way to clarify Jesus’ thinking. At least, that’s my claim! 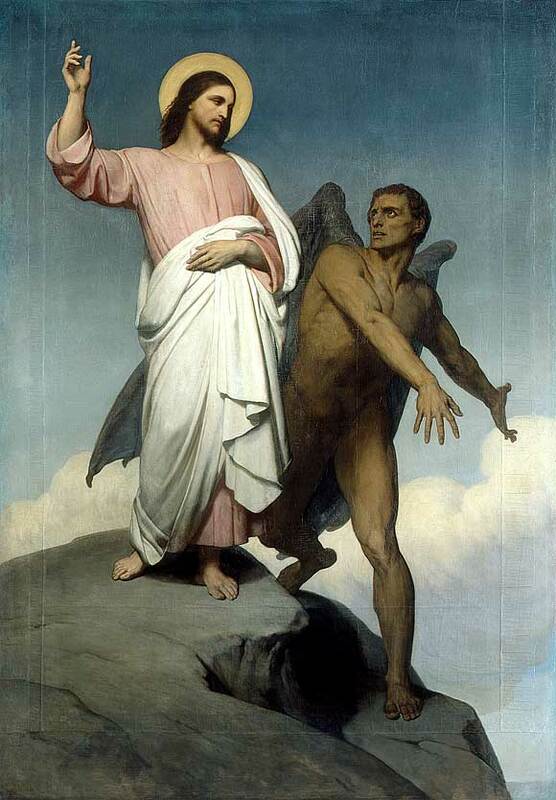 In the first temptation, the Devil preys on Jesus’ desperate hunger. After all, Jesus had not eaten for forty whole days. The Devil dares Jesus to magically transform a stone into a loaf of bread. 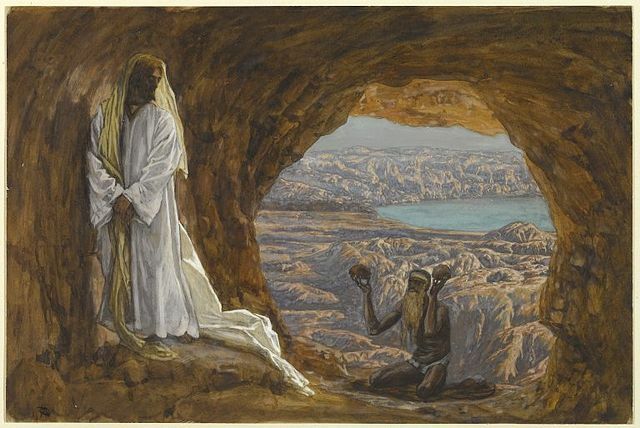 In good Rabbinic tradition, Jesus responds by quoting scripture, in this case Deuteronomy: “One does not live by bread alone.” Now, to be honest, it doesn’t seem at first glance that the Devil is tempting Jesus to do anything even remotely sinful. But I suspect that the Devil is hoping that, if Jesus gives in to even one self-serving act, it will eventually lead down a slippery slope to a Messiah who is more concerned with feeding himself than he is with feeding a multitude of 5000. Repent, and Believe in the Good News! This explains why all three of today’s Bible readings deal in some way or other with the sacrament of Baptism. The first reading from Genesis gives us God’s covenant with the remnants of humankind, those who were saved from the Great Flood. As you may recall, God was disgusted with the sinfulness of his people, and he decided to “reboot the system.” He drowned all the creatures on Earth, with the exception of eight members of one family and the animals that they had collected into the ark. God then made a covenant with those eight survivors, and with their descendants, never to do such a thing again. Now, if we take the story literally, it is horrific. Millions of people must have been drowned. But our ancestors in the faith, including St. Peter, sought a deeper, more spiritual meaning in this tale of mass destruction. And they accomplished this by reading the story of the Flood as a kind of allegory. The waters of the Flood were understood as symbolic of the waters of Baptism. In their understanding, the drowning of the Earth’s many sinners symbolically represented the drowning of our sins in the holy font. Noah’s ark of wood was understood as a symbol of either the wooden Cross of Christ or his salvific Church. Lastly, the covenant of the rainbow that we heard about in the first reading was seen as a prefigurement of the baptismal covenant. 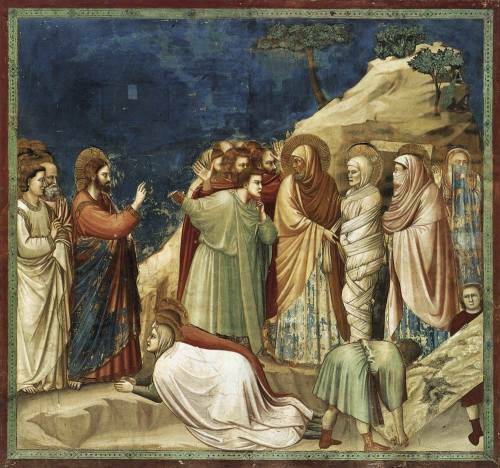 Today we hear about God’s power over death in the story of the raising of Lazarus. Think of today’s Gospel reading as a foretaste of Easter, a preview of something greater still. 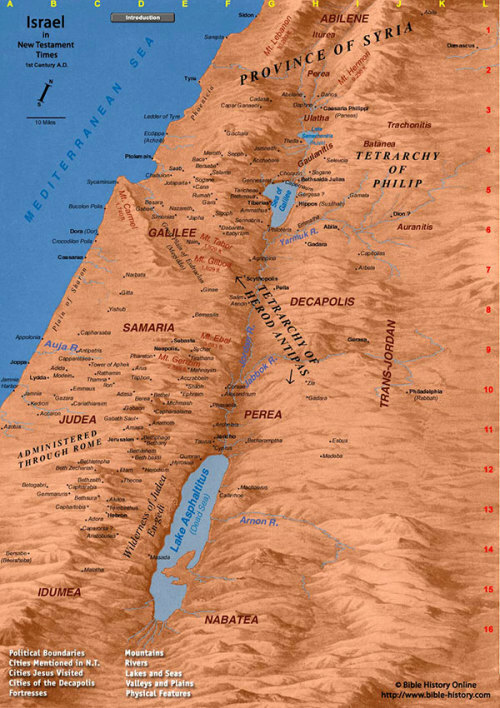 Jesus is in a town called Bethany across the Jordan, when a messenger arrives from a town in Judea, also named Bethany. The messenger is sent from his friends Mary and Martha, asking him to come heal their brother Lazarus, who is seriously ill. Now, unbeknownst to all but Jesus, Lazarus is already dead. Considering the distance between the two Bethanies, it turns out that Lazarus must have died the same day the messenger was sent. Perhaps this explains why Jesus was in no great hurry to head out. Now, in what is one heck of a prophetic double entendre, Jesus explains that “this illness does not lead to death; rather it is for God’s glory, so that the Son of God may be glorified through it.” The double meaning lies in the phrase “that the Son of God may be glorified.” On the one hand, it can simply mean that Jesus will receive honor. On the other hand, it can mean that he will be crucified; for throughout John’s Gospel, glorification is a code word for Jesus’ crucifixion. And indeed, later we’re told that the chief priests plot to kill Jesus precisely because of the stir he caused by raising Lazarus. Today is the first Sunday in Lent, a period of forty days of self-examination and self-discipline in preparation for Easter. The coming of Lent always seems a bit jarring, a time of disorientation and discontinuity. And this discontinuity is reflected in the lectionary itself. For today’s Gospel reading takes place a full eight chapters before last Sunday’s Gospel reading, which featured the Transfiguration of Christ on a mountaintop. And this disorientation and discontinuity is reflected in our parish life, as well. Fr. David is away from us, recovering from a stroke. And we have to do the best we can to keep on keeping on without our leader. We are experimenting with combining the English- and Cantonese-speaking congregations for joint worship, and we don’t know yet how well this will work out. And finally, there is the fact that the Chinese New Year, a time of family celebration throughout much of Asia, falls right during the first two weeks of Lent, a time the Church has ordained for quiet reflection and repentance. This year, the discontinuity and disruption of Lent just cannot be ignored. Now, we’re told that Lent is supposed to be a quiet time, a slow time, but this is surely not reflected in the Gospel reading from Mark. Mark rushes us through three important scenes in Jesus’ life in only seven verses. 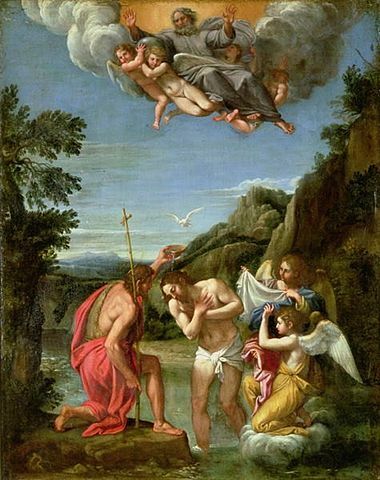 First, Jesus is baptized by John the Baptist in the river Jordan. Jesus sees the heavens torn apart and the Holy Spirit descend into him. (Notice that I said, “into” not “on.” That’s what the Greek text literally says.) And Jesus hears the voice of his heavenly Father acknowledge him. Unlike other Evangelists, Mark does not mention whether others saw and heard what Jesus saw and heard. In Mark’s hurried account, the descent of the Spirit and the acknowledgement of God the Father seem to be meant only for Jesus, a sign that now is the time to start something new. Jesus is empowered by the Spirit, but even so, he is not immediately sent out to begin his ministry in the world. Instead, he is cast out into the wilderness to undergo forty days of trial and temptation. Here again, Mark hurries through this episode in Jesus’ life. 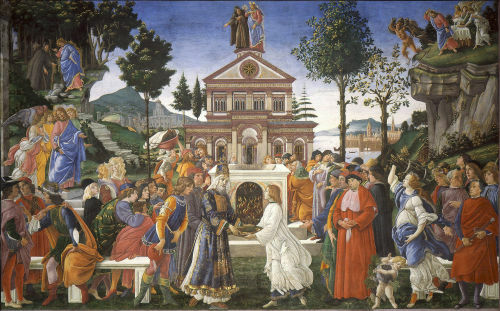 Matthew and Luke go into great detail about each of the temptations of the Christ. Mark couldn’t care less. He has no time for that. The forty days flash by in a single sentence, and we proceed immediately to the ministry of Christ in the world, to his proclamation of the Kingdom of God. 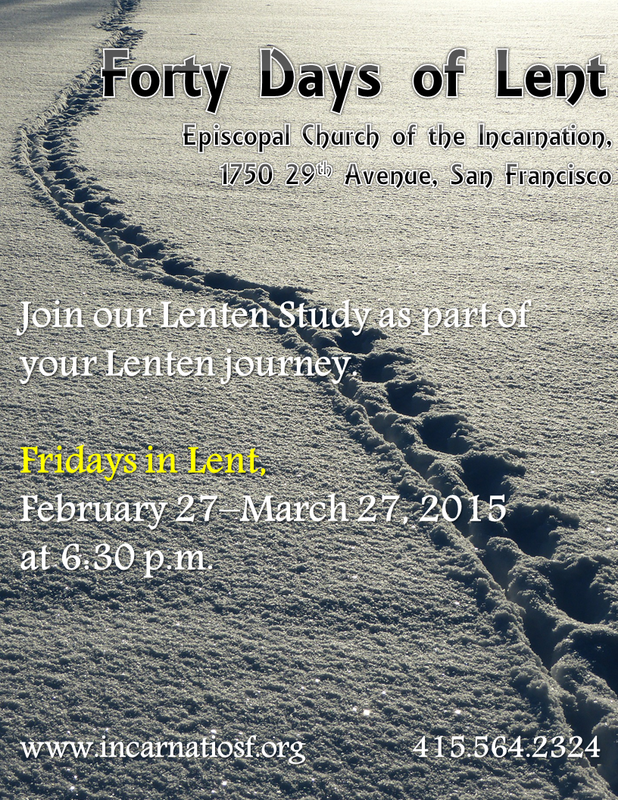 The annual Lenten Study will be held on five consecutive Fridays in Lent, February 27–March 27, at 6:30 p.m. We will be reading Fr. Christopher Webber’s book ‘A Time to Turn: Anglican Readings for Lent and Easter Week,’ as part of the lenten series. In Fr. David’s absence, contact Fr. Darren to get the textbook; the requested donation for the textbook is $10.35. February 27: Discuss “Introduction,” “Ash Wednesday,” and “First Week of Lent,” pp. vii-ix, 1-2, 9-24. March 6: Discuss “Second Week of Lent,” pp. 25-40. March 13: Discuss “Third Week of Lent,” pp. 41-58. March 20: Discuss “Fourth Week of Lent,” pp. 59-74. March 27: Discuss “Fifth Week of Lent,” pp. 75-90. Brief biographies of the authors may be found on pp. 123-28. And of course, you are encouraged to read the remaining chapters not covered in the Lenten Study! Please sign up on the sign-up sheet in the narthex. A sermon preached by the Rev. Dr. Christopher L. Webber on March 30, 2014, at the Church of the Incarnation, San Francisco. A friend of mine who lives down toward West Portal has recently written a book titled: The Election of 1864: Our Greatest Victory. And people have been puzzled by the title. Completely baffled. The election of 1864? Who was running? What difference did it make? How could it be “Our Greatest Victory”? Well, I’m sure you all know that the Democrats that year nominated George McClellan, General George McClellan, and the Republicans nominated – wait, wait, don’t tell me – right, Abraham Lincoln. And the prospects for his election were not good. So on August 23, 1864, Lincoln wrote a memo to his Cabinet anticipating that he would lose the election. The war had been going on too long and people were tired of it. It was time to make peace; let the South go. Lincoln’s wisest advisors told him he was certain to lose. So Lincoln wrote a secret memo sealed until after the election, saying that if he lost as expected, he would cooperate with the winning candidate to preserve the union until the new president was inaugurated, but after that the Union would certainly be dissolved. Of course, if that had happened, we would have had two countries, and slavery would have continued indefinitely. Can you imagine? Still slaves in Texas and the southern states? But if the South had gone its own way, what would have changed it? And more than that, if the country had become divided, there would have been no powerful American armies to win the First World War or the Second. Can you imagine that world? We would be living in a different world entirely. And it begins on a rather odd note, with the Holy Spirit leading Jesus into the wilderness for the express purpose of being tested by the Devil. I say “leads” because that’s the word Matthew uses; in Mark’s Gospel, we’re told that the Spirit “casts him out” into the wilderness. In any case, one thing is clear: the whole episode takes place at God’s behest, not the Devil’s. We’re never told why, but I have some ideas on the subject. I suspect that this time of testing was necessary for Jesus to work out for himself just what kind of Messiah he was going to be, to figure out what kind of Kingdom he was going to proclaim—and to come to terms with the possible consequences of those decisions, such as death on a Roman cross.